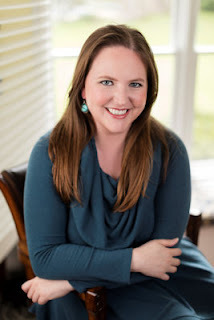 Please welcome Ash Fitzsimmons to The Qwillery as part of the of the 2017 Debut Author Challenge Interviews. Stranger Magics is published on November 21st by Harper Voyager Impulse. Please join The Qwillery in wishing Ash a very Happy Publication Day! Ash: Thank you for having me! I’ve always loved reading, and writing gradually became an extension of that. I wrote my first novel at nineteen, and I was hooked. Ash: When I first tried my hand at long-form fiction, I was a pure pantser—I had ideas and general thoughts about scenes, but I felt my way along. With time, I’ve become a plotter. I may not map out every moment in the story before I begin, but I like to have more than a notion of where I’m headed and how I’m getting there. If nothing else, plotting helps me memorialize ideas for scenes I may not write for months, and it’s always nice to go back to your notes and have one of those, “Oh yeah, right,” moments when you think you’re stuck. Of course, there’s always room for improvisation in writing, and characters tend to surprise you. Once you get to know your cast, some of those carefully plotted chapters begin to unravel. I’ve found that while you can try to force a plot upon characters, it seldom ends well. Ash: Finding enough time! I’m the sort of person who needs to stay at it daily—I get antsy when I’m away for too long, and the story starts to become stagnant in my mind. But responsibilities don’t disappear just because I’d like to spend some quality time with my computer, which can lead to a lot of odd-hours work and a touch of guilt every time I turn on the television. Ash: I’ve always had a fondness for the fantastic. Fairy tales, mythology, folklore, urban legends, science fiction, horror, and fantasy have long been staples of my bookshelves. TQ: Describe Stranger Magics in 140 characters or less. Ash: A lovelorn half-fae bookseller, his amoral brother, a smartass wizard, and an ersatz knight race to save magic and the world. We may be doomed. TQ: Tell us something about Stranger Magics that is not found in the book description. TQ: What inspired you to write Stranger Magics? What appeals to you about writing Urban Fantasy? What do you think is the continuing appeal of stories about the fae? Ash: There are so many current interpretations of the fae, ranging from benevolent (or at least benign) to malicious, making them fairly malleable for story purposes. But even when they look like us, they remain something other, which I think is a large part of their appeal. As for Stranger Magics, it began as a bit of rumination: take an ancient being with extraordinary power, mostly human sensibilities, and a strong aversion to iron, plop him down in the modern world, and what would he do with himself? The rest of the story and its setting gradually came forth. TQ: What sort of research did you do for Stranger Magics? Ash: I revisited the folk and fairy tales I knew, looked into the mythology surrounding the older interpretations of fae creatures, dusted off my Shakespeare, and used all of that as a jumping-off point. On a more nuts-and-bolts note, once into the story, I spent considerable time on Google Maps, trying to plot routes (sometimes from nonexistent places!) and keep a plausible timeline. Juggling multiple time zones can be tricky. 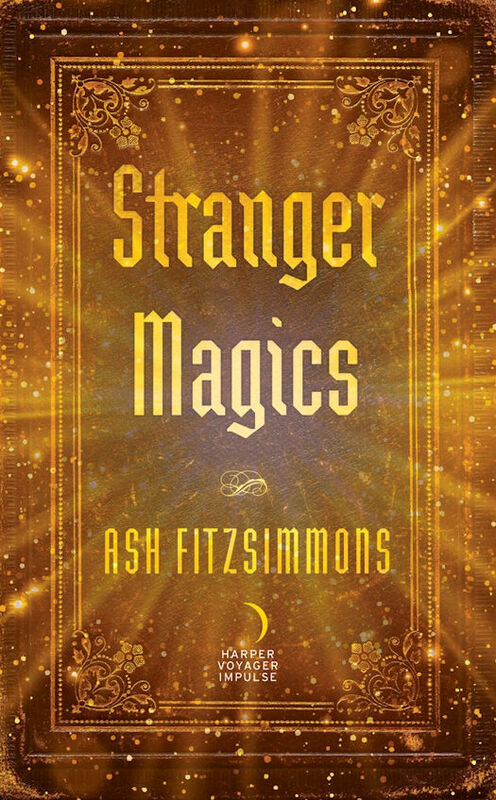 TQ: Please tell us about the cover for Stranger Magics? Ash: The cover design is by Alicia Tatone, and I love how it turned out. An old book is featured heavily in the story, and…nope, no spoilers! TQ: In Stranger Magics who was the easiest character to write and why? The hardest and why? Ash: Toula, the wizard, was probably the easiest character for me to write. She seemed to appear fully formed—blue-tipped hair, attitude, and all. Robin, a faerie, was less forthcoming, but since he’s at best an annoyance to every other character in the story, I suppose I shouldn’t be surprised that he was sometimes difficult to pin down. TQ: Which question about Stranger Magics do you wish someone would ask? Ask it and answer it! Published novel? Absolutely. But as I mentioned, I wrote my first novel back in college. It was a 270,000-word doozy, a great learning experience for me but unpublishable at the time. That realization came as a disappointment back then, but in retrospect, I’m glad that novel wasn’t “The One.” After all, writing is like any other skill: it takes work and plenty of practice, and your first attempt will probably not be your best product. By my count, and depending on whether I choose to remember an unfortunate cycle of short stories, Stranger Magics is my thirteenth novel-length work. TQ: Give us one or two of your favorite non-spoilery quotes from Stranger Magics. 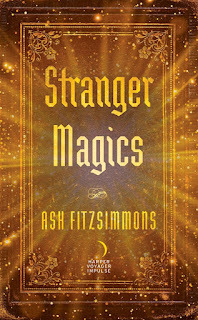 Ash: While nothing is set in stone yet, I’d love to continue the story begun in Stranger Magics. We’ll see! But with family, it’s never simple. He finds Meggy, only to see her yanked into Faerie—and the doors between the realms slammed and locked behind her. Now, it’s not just her life& at stake . . . but the fate of magic itself. When not writing fiction, ASH FITZSIMMONS is an appellate attorney and an unrepentant car singer. Visit her at www.ashfitzsimmons.com.